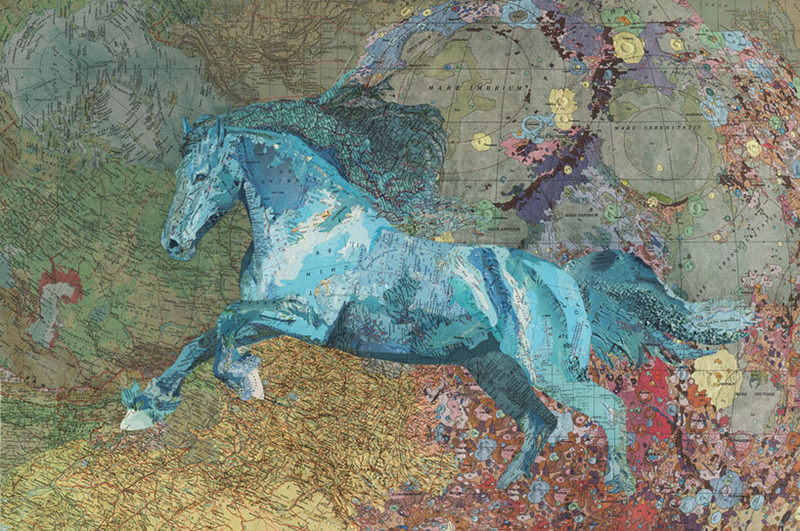 new york-based matt cusick has made a name for himself as a fine artist due to his elaborate depictions of humans and other animals, water and landforms crafted entirely from recycled maps. to develop these collage pieces, he meticulously slices segments of antiquated cartographic works including those of old encyclopedias, textbooks, roadmaps, and atlases in order to layer small clippings into lively, familiar forms. most of cusick’s collages is made colorful by the shades map makers choice to employ in their interpretations of the earth’s surface. it is through past cartographers representations of surface depth, shape and plant-life portrayed in these individuals use of contour lines, darkening, and a vast color palate depicting the planet’s landscapes as the range includes pigments ranging from oceans to rainforests to deserts. cusick provides his depictions with a rich, tactile quality sometimes enhancing his works with acrylic paint or home-crafted walnut ink in order to complement his map-formed figures with additional shading.